1763 (Apr. 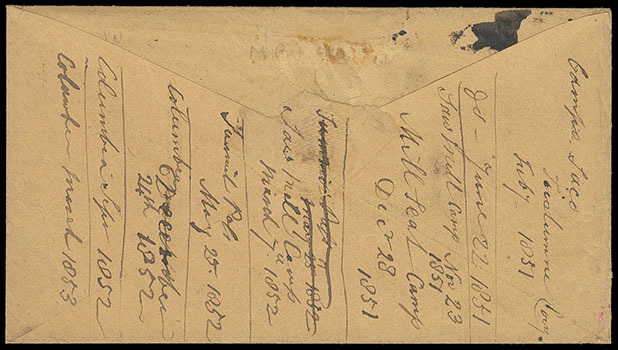 29) Lisbon, Portugal to New York N.Y. via Philadelphia, datelined folded letter carried by private ship to Philadelphia, entered mails with red manuscript "Philad 3-16" postmark and rating, contents concern wine shipments, Very Fine. 1768 (Jun. 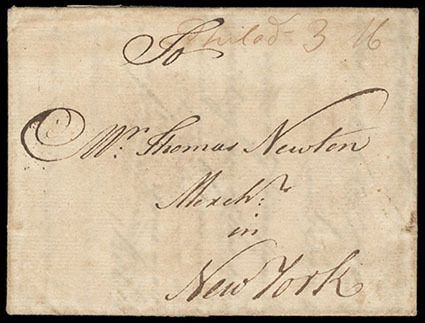 10) Newport R.I. to London, England, folded cover docketed "Mr. Browne, Newport Rhode Island: June. 10. 1768", carried by private ship to England, entered mails with Weymouth / Ship Lre" two-line handstamp, sharp London "20/IJ" Bishop mark arrival and manuscript "5" pence rating, docketed as "Rec'd Decr. 1. 68" and "Answd. March. 1. 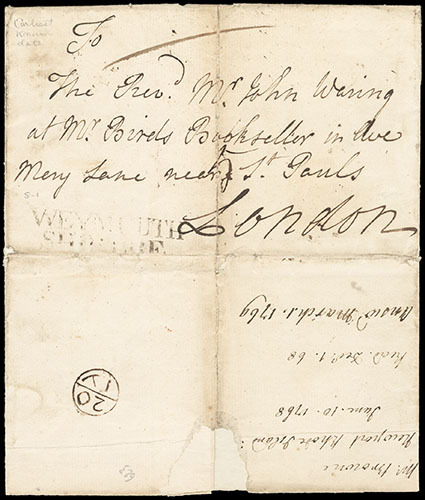 1769"; file fold wear and and soiling, Fine and scarce early ship letter from Rhode Island, ex-Arthur White; with 2007 P.F. certificate. 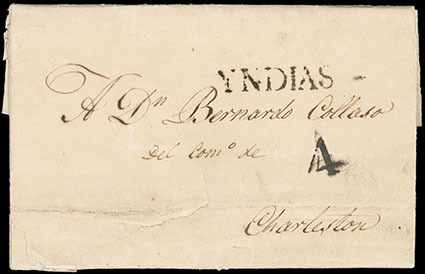 (Incoming from Mexico) Merida y Noviembre 19, 1833, folded letter from Merida, Mexico to Charleston, S.C. correctly charged with "4" reales marking as per single rate, carried by the Spanish mails with "Yndias" straight line handstamp (P.E. 5) struck in Mexico; sealed cover tear at lower left of little significance for this important item, Very Fine. 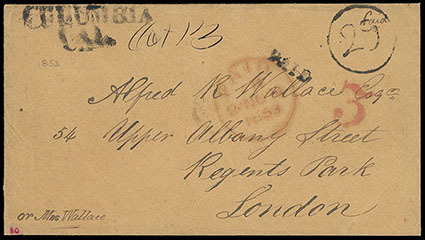 ONE OF ONLY TWO RECORDED COVERS BEARING THE "YNDIAS" POSTMARK ON MAIL ADDRESSED TO THE UNITED STATES. The "Yndias" marking was to denote mail originating from Spanish American colonies on correspondences sent to Spain. In this instance, it was erroneously and exceptionally struck. (Transatlantic Mail) 1845-1851 Letters from Selah Hobbie, 3rd Asst. 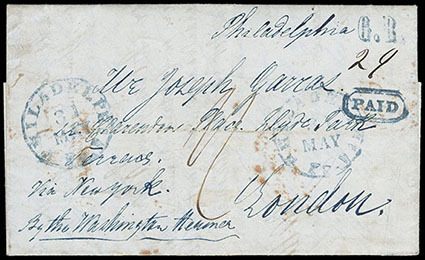 Postmaster Gen., important group of 14 letters (3 from his wife and 1 from family member) including excellent 1847 letter from Frankfurt to PMG Cave Johnson where Hobbie was attempting to negotiate European postal treaties, 1847 letters on aboard SS Washington and from Bremen, 1851 from Panama having journeyed from Chagres, and 10 letters (1845-1850) including additional from the official post office visit to Europe in 1847, the Frankfurt Aug. 28th 1847 letter to Johnson reads in part "…Mr. Dubost of the French Post Office Dept. was not prepared on the final day set…to give me his final counter proposition to mine…He said he must take time until next week…I satisfied myself at Antwerp and Rotterdam of the unpractableness of those places in the winter as ports for the American Mail Steamers. At Amsterdam I obtained some information (& hope to have more communicated) which will enable me to report a suitable port of call (I trust) where we can leave the mails for Amsterdam & the Low Countries…commence my negotiations with the Director General of the Thurn & Taxis posts…hasten on again to Bremen to close the arrangements which were interrupted by Mr. Bancroft's call on me to repair to London. From Bremen I shall again go to London in the strong expectation that by the time the Lords of the Treasury will have rescinded the 1/ tax on our letters; for I am satisfied they will do it if they take the matter up…"; the two 1847 letters on board the Washington and from Bremen are long and very detailed about the luxurious travel aboard the new steamer and the royal welcome in Bremen; the 1851 letter from Panama to his wife is after being appointed special agent and postal commissioner to Cuba and Panama describes travel in great detail, his negotiations were crucial to both the steamship/rail route and to the future politics resulting in the Panama Canal, etc. 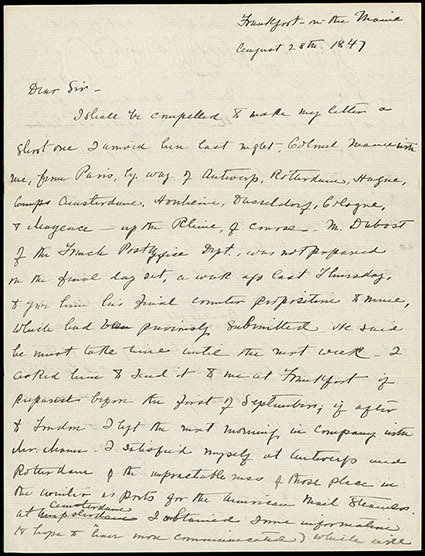 ; the final batch of ten letters includes 5 written while on the historic 1847 trip to Europe, Very Fine. A WONDERFUL GROUP OF IMPORTANT HISTORICAL LETTERS FROM SELAH HOBBIE AND FAMILY CONCERNING POSTAL MATTERS AND TRAVEL. "Washington" Maiden Voyage, 1847 (May 31) Philadelphia Pa. to London, England, blue folded letter datelined "Philadelphia in Pensilvanien 25 May 1847" with blue "Philadelphia Pa., 31 May" cds and matching framed "Paid" handstamp with ms. "29" cent rating for 5¢ inland postage plus 24¢ packet fee, endorsed "Via New York by the Washington Steamer", carried by Ocean Line Washington from New York June 1st to Southampton arriving June 15th 1847, red London (6.17) cds backstamp and ms. "1/-" discriminatory packet due rating as the prepayment was ignored, salutation reads "Mr Henry Lazer. Volunteer in Captain Binder's Compagnie First Pensilvanian Regiment Washington, United States Arrmee" being a German enroute to the Mexican - American War, Very Fine, ex-Feldman. The Ocean Line was awarded the first USPO contract for US mails under the Foreign Mails Act of 1845. Two steamships were built, the Washington and the Hermann and they operated the contact over its 10 year term between New York and Bremen with a stop at Southampton. The "Washington" inaugurated the service leaving New York June 1st 1847 arriving Southampton June 15th. It carried as a passenger, the First Assistant Postmaster General, Selah R. Hobbie. He was bound for Europe to negotiate postal treaties with Great Britain and the German States, but he was rebuffed in England.The commencement of the service led to Britain imposing a "Discriminatory Rate" on mails landed at Southampton with all US prepayment ignored and the One Shilling Packet Rate charged to the addressee. This led to the Retaliatory Rate period and subsequently (February 1849) to a postal convention between the two countries. 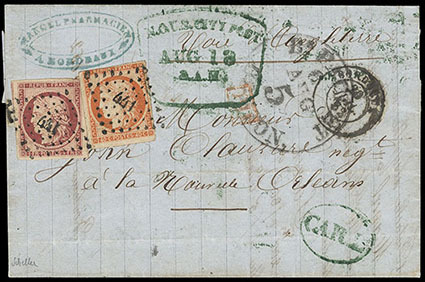 1848-49 Retaliatory Rate Period Postal History, collection of 22 letters carried by Cunard Line during the postal war, each with retaliatory packet rating despite prepayment of postage, includes first sailing to U.S., first sailing to G.B., second sailing to U.S. (1s embossed removed), etc. plus includes 1849 restored rate use via G.B. to France; some mixed condition, F.-V.F. and scarce group. 1850 (Feb. 28) San Blas, Mexico to Indepence Mo. via New Orleans, datelined folded letter with red "Franquedo en S. Blas" (GD87) framed postmark and matching large red "4" rating handstamp on back flap, endorsed "By way of Vera Cruz", entered U.S. mails with red "New Orleans La. Apr 16" cds and matching "Ship" rating handstamp and "12" cent rating; flap torn and separation mostly at top edge, Fine and wonderful use. Letter from an argonaut who chose to take a British brig around the Hom rather than across Panama or overland. It is datelined "Feb 28th 1850, San Blas, Coast of Mexico," and complains of the intense suffering he and his companions have undergone in reaching that place. At Tobago they apparently over-indulged in local fruit and all came down with a form of Montezuma's Revenge, from which three of their number died "It devolved on me to read the solemn funeral services of the church of England…the manner of burial was to sew them up in a blanket, or blankets, putting several bags of sand at the feet to cause them to sink & at the same time stand upright…all have got pretty hearty now & I think permanently so as we have now gotten into a cooler climate, & will be every day getting getting into a higher latitude. When we were all so sick we were becalmed, within 5 or 6 degrees of the equator … We have stopped at this place to take in provisions and water. It will take 20 or 30 days yet to get to San Francisco…". 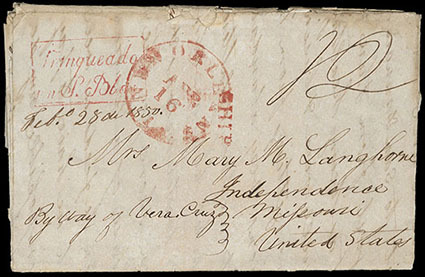 The letter was carried overland in the Mexican mails from San Blas to Vera Cruz. It was carried by ship from Vera Cruz to New Orleans; probably from there to St Louis by steamboat and on to Independence either overland or by a Missouri River steamboat. 1850 (Apr. 26) New York N.Y. to Cognac, France, gray folded letter with New York pencil "21" prepaid rating and endorsed per "Steamer 'Atlantic' ", carried as endorsed by Collins Line Atlantic from New York Apr. 27th to Liverpool arriving May 10th, red London (5.11) transit backstamp and matching red "U.S. Pkt." handstamp, Calais (5.12) arrival datestamp and manuscript "16" décimes due rating, fresh and Very Fine. A CHOICE USE WITH THE RARE "U.S. PKT" HANDSTAMP CARRIED ON THE FIRST AMERICAN PACKET SAILING OF THE COLLINS LINE. 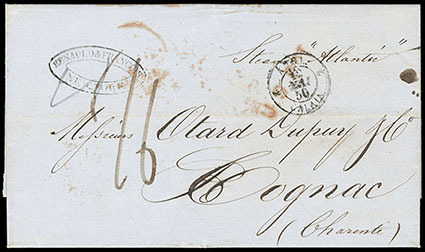 This letter was treated as an unpaid double-weight letter with "16" décimes due in France. 1852 (Jul. 20) Bordeaux, France to New Orleans La., blue folded letter with bearing France 1f carmine, 40c orange, both four margins tied by "441" lozenge cancels, matching "Bordeaux, 20 Juil 52" origin cds and small red "PD" framed handstamp, carried by Cunard Line Niagara from Liverpool Jul. 24th to Boston arriving Aug. 5th, "Boston, Br. Pkt. '5' Aug 5" debit exchange cds, green "N.O.U.S. City Post" snow shovel and oval "CAR 2" handstamps, Very Fine and attractive New Orleans transatlantic carrier use. 1853 (Oct. 13) Columbia, Cal. to London, England, buff cover bearing "Columbia, Cal." 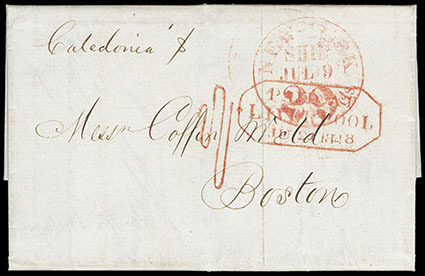 two-line postmark with manuscript "Oct 13" dating and matching "Paid" and crude "29" in circle rating handstamps, New York red "3" credit handstamp, red London Paid (11.2.1853) arrival cds; small edge tear and flap faults fixed, otherwise Very Fine and scarce.